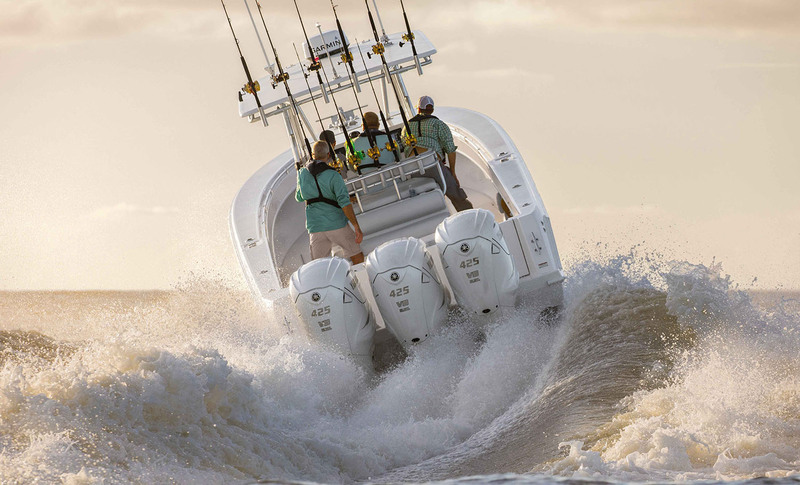 The Yamaha F425 is designed specifically to power large, heavy center console fishing boats. Yamaha has introduced a new V8 outboard that produces a whopping 425 horsepower. and boasts some pretty impressive numbers using lots of new technology. 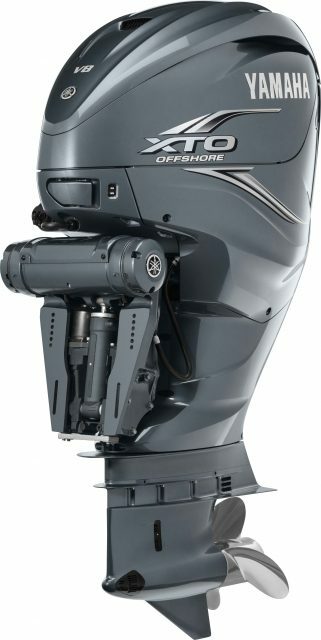 The past few years have been great for those of us who love outboard engines, with red-hot introductions like the Suzuki Df350A and the expansion of the Evinrude G2 line-up, and now Yamaha is grabbing the headlines with a new 5.6 liter V8 F425 outboard which produces – yes, you guessed it – a potent 425 horsepower. The F425 XTO Offshore is an all-new design that breaks a number of rules and sets a number of firsts. First off, let’s take a look at the engine’s specs. This is a 5.6 liter, 32 valve, DOHC powerhead that produces 425 hard-charging Yamarabian horses at 5500 rpm. Max recommended rpm range is 5500 to 6000. It weighs in at 952-pounds in the 25-inch shaft version, 977-pounds with a 30-inch shaft, and 999-pounds with a 35-inch shaft. Alternator output is 90-amps. It can be mounted on 28.5-inch centers, and earns a three-star CARB rating. The F425 comes with a five-year recreational warranty and gets three years of coverage for government use and one year for commercial. Performance on a Contender 39ST is an eye-opener – that old phrase “sit down, shut up, and hold on” will be more applicable than ever. 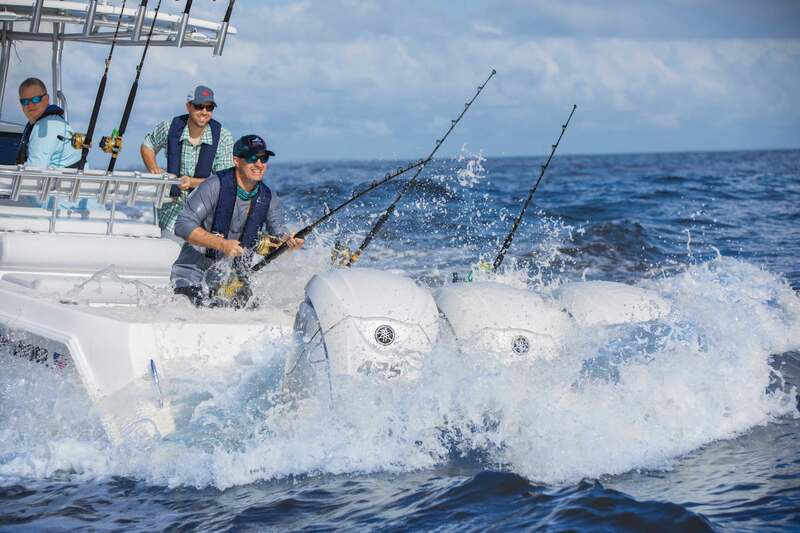 Yamaha has published a performance report on a Contender 39ST rigged with triple 425’s, and in our experience, their performance bulletins are spot-on (usually within a tenth of a gph and a few tenths of a mph of what we see with our own eyes). They recorded a most efficient cruise at 3500 rpm while moving along at 36.6 mph and burning 37.3 gph, for 0.98 mpg. Of course, you’ll only get that efficiency if you can manage to leave the throttles half-cocked – something few of us will do whenever the seas allow for a speedier run to the fishing grounds. At a much more realistic 4500 rpm cruise, the boat maintains a 53.4 mph clip while burning 60.0 gph. That gets you 0.89 mpg, which is pretty darn respectable for a boat of this nature. When it’s flat-calm and the throttles get slammed down against the fiberglass, speed climbs to 72.7 mph at wide-open throttle. Fuel burn also climbs, to a whopping 113.8 gph. And aside from the entertainment value of wind-blasting your crews’ hats and sunglasses away, at that rate of speed you’ll still be getting 0.64 mpg. The F425 is quite unusual in a number of ways. For starters, this is a direct fuel injection engine. 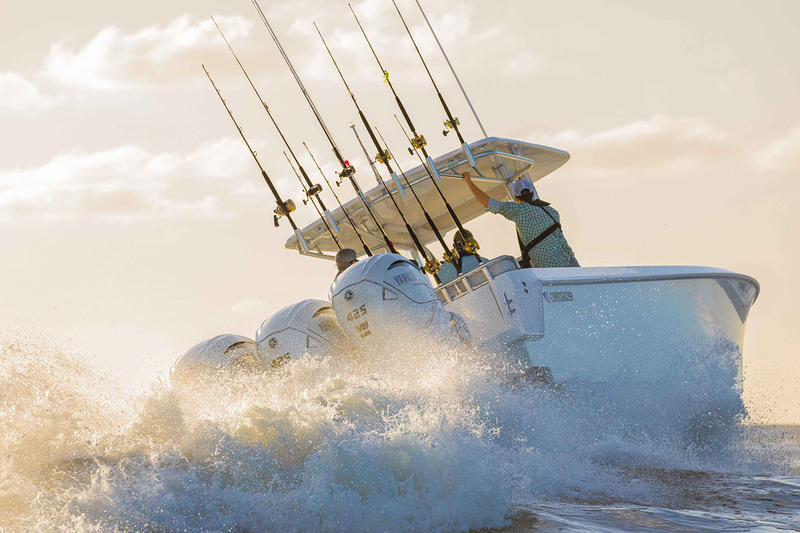 DFI has been reserved for two-stroke use up until now (at least in outboards, though it’s not uncommon in automotive applications), and Yamaha manages to make it work by employing five different fuel pumps. When the fuel hits the injectors, it’s pressurized to the tune of 2900 psi. Added bonus: the F425 can run on 89 octane fuel, while many other high-power outboards demand the more expensive stuff to create max horsepower. Take a close look at the mounting bracket on the Yamaha F425 XTO Offshore. Notice anything unusual? The engine also has sleeveless plasma-fused cylinders, an application Yamaha started utilizing some years ago in SHO models and expended through much of its line. An alloy dust comprised of chrome, nickel, magnesium, and some uber-secret stuff gets super-heated into plasma, then fuses to the cylinder walls. Yamaha claims the net result is 60-percent harder than steel yet reduces the engine’s overall weight, while also reducing friction. If the motor’s mounting bracket looks a bit odd, there’s a good reason. Yamaha chose to incorporate an electric steering system into the system. This is a rather unusual (read: never used before on an outboard) system, and Yamaha believes eliminating the usual hydraulics will reduce maintenance while delivering better performance. In any case, it certainly reduces rigging clutter. Another unique touch can be found in the exhaust system. Like most it’s through-hub – until it isn’t. When operating in reverse the exhaust gets re-routed away from the hub, to give the propeller a better bite. Yamaha’s claim is that the net effect is 300 percent more thrust in reverse than the F350C was able to provide. You want to be able to back faster on billfish? The Yamaha F425 can make that happen. Okay, we know everyone wants to know about pricing, but Yamaha hasn’t let that particular cat out of the bag just yet. The engines are due to hit the market in August, so we suspect this information will come sooner rather than later. Stay tuned, we’ll keep you updated. Yamaha-f425-6 caption: Outboard lovers, rejoice! The new Yamaha F425 XTO Offshore will be hitting an ocean near you, in a matter of mere months. 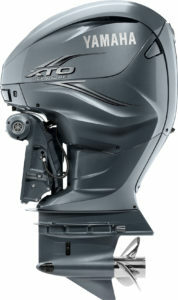 For more information, visit Yamaha Outboards. You think you have to be rich to afford a sweet new fishing boat? These three rigs will make you think twice. Yamaha Helm Master – Do You Want It, Do You Need It?